Omachron’s modular extrusion systems extensively tested to produce Plasti-Block solid colored rods and blocks. This new equipment is 95% smaller, uses 95% less energy, and is 75% less costly than competitive machines. These are small, desktop systems from 1 hp to 20 hp that provide 10 to 600 lbs. per hour of melt flow. Pontypool, Canada, January 29, 2019 --(PR.com)-- Plasti-Block brand uses a unique, modular extrusion and injection molded systems based upon new screw, barrel and feed designs. These innovative systems employ low-shear, high-mix, low-pressure, melt architecture with high precision, closed-loop computer control driven by high-accuracy temperature and pressure-measurement subsystems. The result is a compact arrangement that uses up to 95% less energy per pound of material processed and can typically achieve a dimensionally stable product within 20 minutes of being turned on, thereby minimizing the expense of startup and product changeover. A typical 5 hp system with the unique auto-start sequence can easily be purged between colors with 10 to 20 pounds of material, and startup typically requires 10 to 20 pounds of material until dimensionally stable product is being made. These systems are small and the subsystem components are light enough to enable all maintenance to be carried out by 1 or 2 people in minutes, not hours, without the need for a crane or other lifting equipment. The Plasti-Block brand utilizes compact, low-pressure, low-power-consumption, low-capital-cost, downstream equipment including dies for making thin film, sheet, profiles, tubing, pipe, corrugated pipe and other new products. An important consequence of the low-shear, high-mix, low-pressure system is that it results in geometrically accurate parts with little or no internal stress induced by the forming process, yielding parts with excellent mechanical, physical, optical and chemical properties. Plasti-Block (TM) plastic blocks, rods and other injection molded shapes can guarantee final manufactured parts to have very tight tolerances. An article describing innovations using to manufacture Plasti-Block products was recently featured in Plastics Technology Products News. 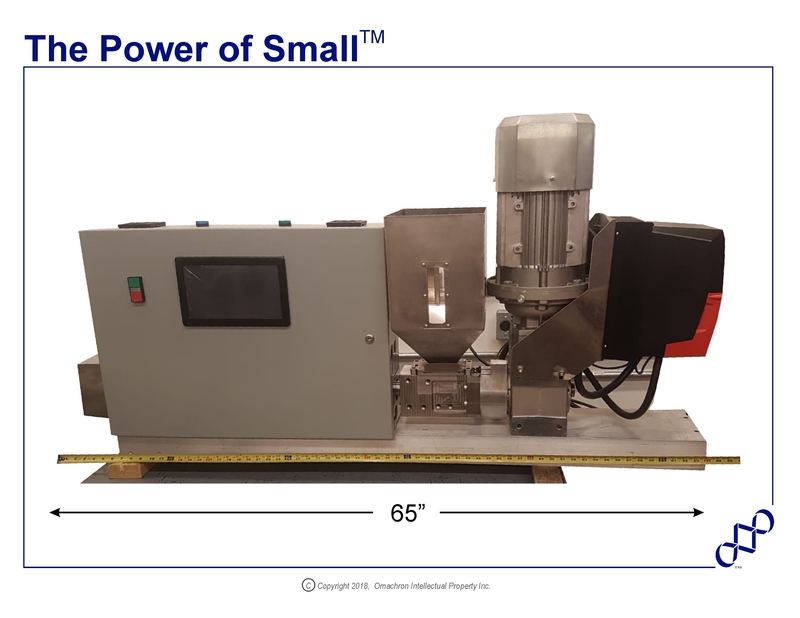 This article outlines the features and benefits of our amazing new plastics processing technologies focusing on The Power of Small(TM). The system uses up to 95% less energy per pound of material processed, it's light weight and affordable.